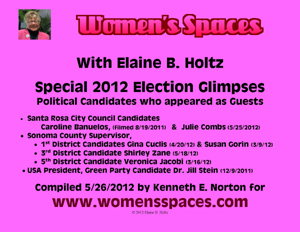 The video of the show can also be seen on the home page of Women’s Spaces, www.womensspaces.com as it is being broadcast on Cable TV the whole month of August 2012 per the schedule under the video on the home page, and will remain there for a couple of months, first as a current show being broadcast on Cable TV and then as a Recent Show. The Archive page is the more permanent location. This archived show is being featured since President Barack Obama named Dolores Huerta as one of the 13 recipients of the Presidential Medal of Freedom, which he will present to her at the White House on May 29, 2012.